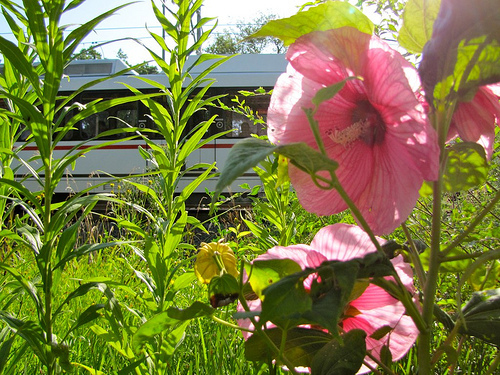 Laura Neuman-Howe, the amazing woman who has been tending to the flowers and native plants along the Delmar MetroLink Station for four years, was easy to spot this morning. 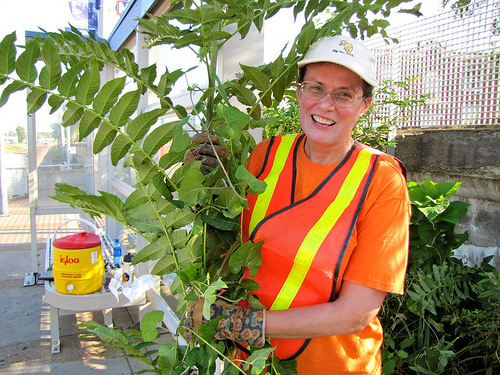 She was standing on the westbound platform wearing a safety vest with gloves, shears, bug spray and sunblock in hand, ready to reclaim the flower beds from weeds and small trees. It was a big task. Thankfully, Bec Shane, a Washington University graduate student, came to help. 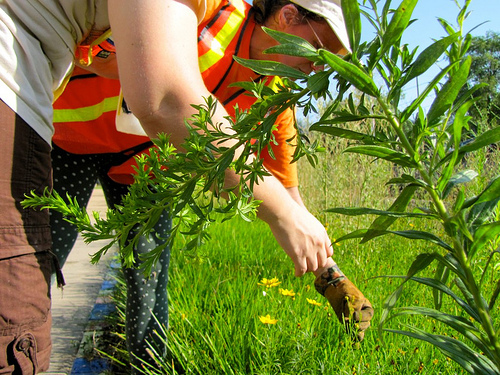 Laura shows Bec some of the more pervasive weeds in the bed along the walkway to the Park-n-Ride lot. 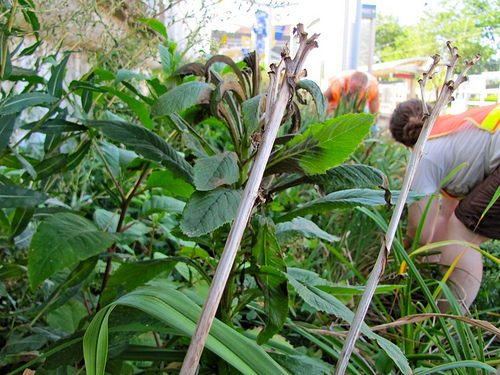 The bed is home to native grasses, hardy hibiscus, liriope and even sage. 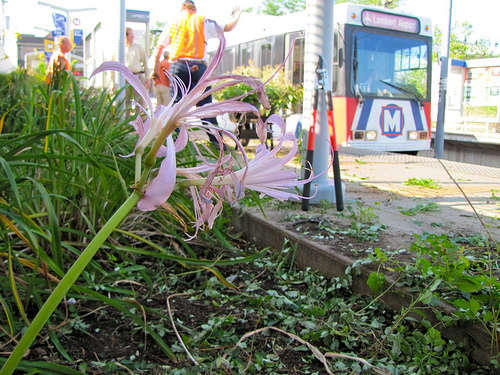 Removing overgrowth revealed lilies along the westbound platform. Progress! The bed will still need time and care, but are now free of many of the most relentless weeds and trees. 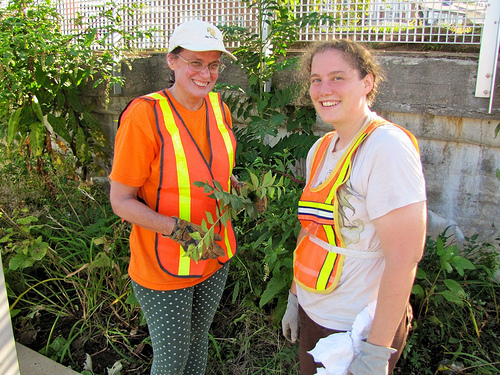 Thank you to Laura for all of her dedication, and Bec for coming out in the terrible heat to look after the Delmar Station flower beds. Laura is looking for someone to take her place in working to keep the beds maintained in the future. If you are interested, please email laura@earthsharemo.org. Plant trees. Put some shade on the platform. 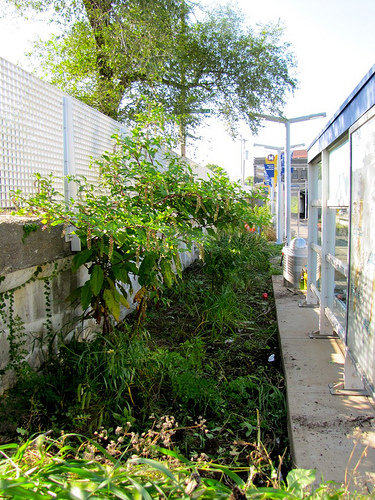 I was going to weed the Delmar station area, but last Friday, I got stung by a bee!